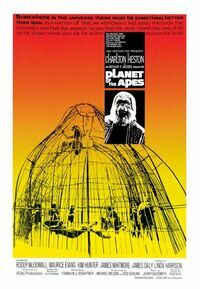 Planet of the Apes is the filmed version of the French novel by Pierre Boulle starring Charlton Heston as one of four astronauts to land on a foreign planet inhabited by human-like apes. A classic science fiction film from the late 60’s. All text information on this page is licensed under the terms of the Creative Commons License and under the GNU Free Documentation License. See Copyright for more information. We're cooperating with www.moviepilot.de and tv-browser.org.